Urbanists need to regain control. The traffic engineer and landscape architect have had their way with the civic realm of our cities and towns for too long. The public spaces of any master plan are in fact the most valuable aspect of the design. Care should be given toward their creation and they should not be turned over entirely to any one specialized discipline. The conception of a great civic realm, anchored by wonderfully, local public spaces, should be the principle goal of any urban design. Beauty will last the ages. If we are to truly build resilient settlements their public spaces must endure for generations. We do not have the luxury to waste on failed endeavors. The founding, or renewal, of a public space is critical to the success of any urban place. The square gives a neighborhood its identity. With success in mind, Urbanists must utilize all the characteristics of a successful public space —particularly the required management and diverse funding that allow for them to endure. As the New Urbanists increasingly look to retrofit suburbia, a similar eye must be put upon the many lost, miss-used or forgotten spaces that exist within our built environment. All land must not be underutilized. Perhaps our society does not yet understand the benefits that non-traditional American public spaces provide? In other parts of the world, a “shared space” is a cultural foundation. 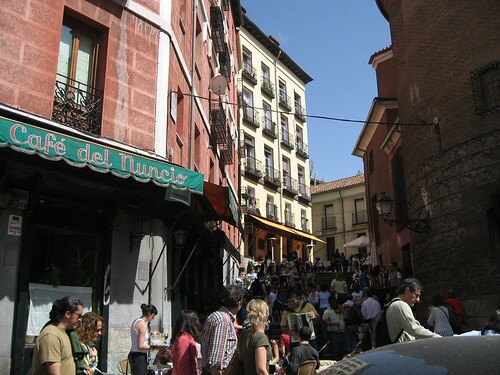 They are the streets and plazas that allow city life to exist. Traffic engineers had no hand in the creation of Rome’s piazze. We must learn from these cultures, and as American’s understanding of public space evolves we should not be timid about introducing these ancient forms into our plans. Today no one is looking after the whole of the civic realm. Our professional culture has specialized out of existence the generalist. And it is the generalist that understands what is required to grow a beautiful public space. As Urbanists, we understand the whole system. As Urbanists, we can conduct the symphony required to produce authentic beauty throughout our civic realm. “Today nobody is concerned with city planning as an art — only as a technical problem. When, as a result, the artistic effect in no way lives up to our expectations, we are left bewildered and helpless; nevertheless, in dealing with the next project it is again treated wholly from the technical point of view, as if it were the layout of a railroad in which artistic questions are not involved.” (Sitte, p.223) In 1889, Camillo Sitte published “City Planning According to Artistic Principles.” One hundred and twenty years later little has changed in the practice of city building. The value of artistically created space has still not found a voice in the modern world. Why? Shaping the public spaces of our settlements to support an enduring way of life is essential to both the economic development of a place and its overall resiliency. For decades, the artistic expression of our public spaces has not been the driving force behind the projects that shape our built environments’ identities. Beauty, comfort and the higher ideals of a place must be resurrected as the organizing force for city builders. We are still trapped by the statistics of the engineer and dull line of the drafting ruler when it comes to how we create our built environment. A Living Urbanism requires a sophisticated civic realm. The civic realm can actively be identified as our publicly celebrated structures. However, our libraries, churches and governmental building are only a small, but visible, piece of our civic realm. A mature civic realm can be conceived of as the entire system of public spaces both contained by these civic buildings and connecting them. Contrary to other classification systems, I would like to propose that the civic realm is made up of only two categories of public space. In the most complex of conditions Shared Space and Landscaped Space, supported by quality public and private buildings, can provide the full range of conditions required for a meaningful civic realm to exist. A Shared Space can be characterized as a piazza, piazzetta, plaza and, most importantly, streets and thoroughfares. I find these spaces fall under the guideline that urbanism enjoys complexity. These are “mixed-use” spaces in true form. Surprising is that within the best urbanism these spaces make no special consideration for the car. Properly programmed, multi-modal and effectively scaled the street is the most abundant of all shared public spaces. Yet we dilute the street down to a traffic tool in all American conditions. Why? When there are so many precedents for how a street can support all modes of transport equally. Few, if any, engineers will stamp drawings for the construction of a true piazza, piazzetta or plaza effectively removing these timeless forms from the urbanist’s palette. Our struggles for reducing the width of streets has taken too long. The ability to develop a true piazza needs to be possible. We must resurrect Shared Space as a possible modern urban form. Landscape Spaces exist to connect urban dwellers to nature and to support the emotional experience of the pedestrian. Landscape Spaces create the contemplative places within a village, town or city. They are formed by having a strong connection with nature. The quay running along the river Siene in Paris, the great lawn in New York’s Central Park and the tree lined promenades of Villa Borghese in Rome are all stunning examples of how a Landscape Space gives emotion and soul to a city. Care must be given toward balancing the scale, orientation and natural features of our greens, squares, gardens and parks to ensure they offer the urban dweller relief in any form they wish to find. Is a boulevard really a successful public space if it does not provide a pleasing escape for the pedestrian? Is a small plaza really a successful public space if it does not allow for the cafe to swell in the evening filling ever available square foot with patrons? As we contort the forms of our civic realm to support the modern demands placed upon them by public process and the science of traffic “engineering” (Jacobs, p. 72) we lose the characteristic that allow these spaces to be the foundation for a vibrant and living urbanism. As Urbanists, we must take up the Prince’s challenge. By giving modern meaning to the characteristics of a quality public space we can allow a boulevard to be a boulevard and plaza to be a plaza. We should no longer support the hybrid, or false, forms being forced upon our citizens. Balancing the form of a public space is essential. It is most successful when all three dimensions of the space, as well as the surface treatments and sculpture, are considered in concert. It is understood that the containment of a public space is critical. Establishing the constraints of the outdoor room is also linked to the width and length of a public space. As mentioned earlier, we struggle to create narrow streets. I would also like to propose that our squares, and if we could build them, plazas and piazze are much too large. Christopher Alexander has also developed several patterns which I find often over-looked in contemporary practice. Do modern planners or landscape architects consider the population of a public space when considering its most effective size? It is time to reexamine the size and proportions of the public spaces we design and ensure that they are appropriate to the activities, surrounding architecture and number of users. Size does matter. Layers exist within all great public spaces. Picture the Piazza del Campo. The image of Siene’s Palazzo Pubblico, with its great tower, might come to mind, or the comfortable slope of its fan shaped form. But, with further scrutiny one can begin to see the layers of this space more clearly. The cafés, with their deep sienna brown awnings, situated on the ground floors of the surrounding buildings establish the outside layer and give the piazza its essential active edge. Just as important as engaging uses at the ground level is the composition, slightly varying fenestration and harmonious cornice line of the surrounding buildings. The tower pierces the perceived ceiling of the piazza completing the required characteristic that a public space be engaging in all dimensions. The tower can quickly be established as this spaces center, but with more investigation one will find that the square in fact has many centers. The portico of the Palazzo, opposite the portico is the Fonte Gaia, typically the square as several vendors dotted along its inner edge, the ring road between the cafés for strolling the circumference of the space and the sloping red brick floor with its many groups of seated onlookers all provide a difference experience. The addition of each of these layers enriches the composition giving the public space more significance. Significance for public space can mean many things. Great spaces possess significant gravity. Several blocks away one should be able to sense, as if it is pulling you in, the nearing public space. This energy emitted from a significant public space attracts more than just pedestrians. At times this can create a gradient of taller builds, more intense ground floor users and increase in the number of intersections and streets. This gravity can also give a neighborhood its identity. “I live just off Washington Square Park” not only uses the significance of the square to orient location, but demonstrates how the gravity of the public space imposes identity on the surrounding blocks as well. The gravity created between the constellations of public spaces present throughout a civic realm give additional vibrancy to the traffic that flows throughout the city. This pulse of mobility gives life to not only the centers of activity but the various arms connecting them. There are additional spaces that surround and lead into the primary place. They are the foyers for publics space during large events, the quieter plaza filled with cafés just outside the busy market square or the commercial nodes just outside the gates of the public garden providing refreshments to the scene. A healthy civic realm has a constellation of iconic public spaces. Each of these individual spaces possesses a constellation of supporting space. They might provide relief during extreme conditions or give space for services to support the active edge of the square. A single public space is better when it is part of a series of spaces. This fractal relationship gives vibrancy and depth to a living urbanism. Public spaces are living. They breathe, sleep, require maintenance and enjoy company. As urbanism ages it continues to grow, change and adapt to the conditions of the time. This is true of the public spaces within that urbanism as well. Over designed and ridged alignment to uses significantly hinder the successful aging of a public space. These spaces must possess a certain amount of flexibility. This is even true within the span of one year. The best public space can support its citizens throughout the year. There is no “session.” The life of the city should not halt in winter. Prague does not close its squares due to cold weather. The many groups, clubs and organizations that a loved public space establishes will further extend the life of these places. These groups will give guidance to the space and provide resources as it ages. Quality public spaces are living infrastructure. A timeless public space is beautiful. This perhaps is the essential characteristic. Beauty is of course in the eye of the beholder. However, on average the dull, rigid and sterile places that mid-century planners conceived of as beautiful public space have failed. Beauty to the masses, not to a small group of intellectual designers, is essential for a public space to be successful. This beauty ensures the long term enjoyment of a space is certain. Fashion changes too frequently. To let it guide the creation of public space is a mistake. Beautiful squares, plazas, parks and gardens are multigenerational investments. Their form must be timeless for the required investment to be worth its value to a society. Beauty is more likely to be loved, and loved public spaces are more likely to spawn the groups required to maintain and care for it as the life of urbanism surrounding it unfolds. A loved public space endures. What does the civic realm really mean to the city? Inevitably cultures and societies evolve. The civic realm provides the platform for this evolution. The civic realm is both the glue that holds a society together and a mirror that allows it to see its failures. This question is not correct; the civic realm means different things to different people. The meanings are not important, but the fact that the civic realm is present in one’s life is. We are just now becoming aware of what the lack of a civic realm can do to a culture and a society. The civic realm engages the memory. It provides a physical history of a place either through the preservation of its best historic structures or through the generational interaction and story telling that gives rise to the myths of a place. The public spaces of living urbanism should persist within one’s memory. The mind should hold on to their image long since created. The most literal representation of the civic realms memory is those monuments and memorials erected to celebrate our past and the people who made life possible. Either in the squares of Savannah or under Napoleon’s Arc de Triomphe the physical memory is real. It is these memories, provide in large part through the civic realm, that serve to give a place its soul. One comes to respect both one’s place and oneself more in the presence of the past’s greatest accomplishments. This respect, carried by the citizens’ sense of a place, resists filth, counteracts vandalism and elevates the spirit of said place. Given respect, by way of the connections to previous accomplishments, a successful civic realm’s public spaces will be cherished. The cycle of a person’s involvement with the public spaces of their civic realm will come to teach them how to care. It will give them pride for their locale and its continued success. Pride will lead to ownership. The city will become one’s own and in time this ownership brings one further comfort in its spaces – a comfort that makes the city a home. Through a populations life cycle of experience within a civic realm, many stories will be crafted which, over time, will enrich the memories of a living urbanism. A market square is more then just the physical space of the market square. Public space is a platform for the life of a city to unfold. However, a play needs its actors, script and time of performance to bring an audience. Successful public spaces require users. The best of these places provide activities for their users. The smallest parking court can be elevated to a public space when planted with a fruit tree. The cycle of caring for the tree, picking its fruit, smelling its flowers and enjoying its shade can create public space out of the simplest of utility areas. The activities in larger public spaces are produced. There are stewards of the space that initiate the production of the activities required to seed the cycle of involvement that leads to the long term enjoyment of a vibrant civic realm. Just as important as the physical characteristics of a space are the activities carried out within, surrounding or through it. We have discussed the importance of the edge activities. But, often these need to be support and enticed by the activities available in the space proper. Just as the civic realm is divided into shared and landscaped space, activities can be passive and active. There is a strong correlation between landscaped spaces and passive activities. However, a quiet piazzette, with several café tables can be the loveliest of places to rest. Fred Kent, president of Project for Public Spaces, states that the best of public spaces are programmed by “zealous nuts.” It is these groups of nuts that knit together a square or park to improve its gravity, give opportunity for the creation of memories, and fundamentally provide for the enjoyment of future generations in the space. At the center of a large publics space’s groups must be a “Friends of Great Kennedy Plaza” or a “Central Park Conservancy.” These organizations manage, fund and govern the ongoing operations of the space. They ensure its characteristics remain in place or improve. It is unfortunate, but modern urbanism requires successful large public spaces to be run like businesses. Did Rome require Friends of the Forum? What kept the “geomorphic” spaces of unplanned cities running? (Kostof, p.43) We currently have no living tradition for the stewardship of our public space. During the last century, Americans learned that the stewardship of our native landscapes was worth the effort. During this century, we will learn that the stewardship of our village, town and city public spaces will be worth the effort as well. We must learn from Olmsted’s dual understanding for both the natural importance of Yellowstone’s preservation for the country and the complex details that would lead to Central Park’s success for New York. Both are of equal importance. Both required stewardship. It is yet to be seen what type of global economy will be left, but being the optimist it is likely that global markets will still exist. The interesting thing about being competitive in a global market has a lot to do with the strength of your local market. For cities to be competitive globally they will need to differentiate themselves locally. Leveraging the advantages of the local arts, culture, landscape and vernacular building tradition is the foundation for cultivating a unique place in a global market. And we learned that a beautiful civic realm supports all of these items. A resilient civic realm sets up so many factors that encourage innovation. In time of recession, people take to the streets with market stalls and push carts. These local economies would not be possible without established public space. Random encounters can lead to innovative interaction. The streets, square, plazas and parks are the places for locals to interact and improve their craft or practice. What significant arts movement has been cultivated and supported by a suburban location? Movements, the type that inspire generations, begin in the cafés and piazze of our cities. The physical space of a city should be painted. Its beauty should be sketched, photographed and act as a well spring of creativity for future movements. A resilient civic realm captures the creativity of the group. The arts are perhaps the most radical of economies, but their practice is essential to pollinating the garden of innovation required for local economies to be successful. Fundamentally, a movement, either business or cultural, needs to be inspired. A living urbanism’s civic realm must provide this inspiration. Civic and cultural institutions further enhance a local economy. Good public space gives visibility to these institutions and provides the essential link between the “Res publica” and “res privata”. These institutions are not only captured in the physical form of a museum or cathedral. Conservation can begin with a discussion in the square. Romance can ignite with a stroll through the garden. Just as a public space can give identity to a neighborhood, a resilient civic realm can help establish an attractive local culture. The institution of a romantic city can be a powerful enabler of the local economy. Local economies are even more fine grain. The arrangement of public space gives identity to a district. The power of a good space provides the name to a neighborhood. These names can endure long past the time of their original conception. The economic power of a great civic realm can be demonstrated in the suburban shopping center habit of adorning placeless destinations with names traditionally assigned to the best public spaces. A healthy social interaction, one that supports local economies, takes place in the public spaces of a living urbanism — commerce, or trade, originated in public space. That tradition is still present. I witnessed a chance encounter between two businessmen aboard a San Francisco trolley. One man hopped on, struck up a conversation with the man seated next to him and the next thing I knew they were getting off at the next stop heading toward the coffee shop to discuss a possible new venture. This is just one example of how a comfortable civic realm, not to mention public transit surrounding such areas, can support economic innovation. And if you believe Jane Jacobs, it is this type of innovation that keeps places alive. As Urbanists, we are responsible for helping to craft the foundations for a resilient place. A living urbanism is the best example of such a place. As we’ve discussed the creation, stewardship and enjoyment of a beautiful civic realm can have a profound effect on the successful passing of time. Celebrations and ceremonies are conducted within their enclosure, demonstrations are held in times of unease and direction given in times of crisis. The public spaces of our settlements are critical to their long term sustainability. These spaces are the constant throughout the lives of the citizens. Great care must be given to their creation and renewal. A beautiful public space can offer both a joyful reminder of the past and inspiring insight to the future. As urbanists, we must realize that complexity is resilient. Natural ecosystems enjoy complexity as an essential piece of their endurance. Can a complex collections of public space help a local economy support itself during recession? Will these same public spaces improve themselves during booms? Many options are always more enjoyable than fewer and it seems as if contemporary planners, and even new Urbanists, are limiting the complexity possible in our built environment. A city or town should have a diverse selection of public spaces, each giving different types of citizens enjoyment. The stimulation of an elegantly complex civic realm keeps a culture renewed. A living urbanism begins with community and space. It is the act of shaping this space that gives life to a place. Pleasing public space is the insurance that greater things are possible in a place. The quality of the civic realm is completely related to the comfortable level of density that the private spaces of a village, town or city can support. A sophisticated civic realm allows for a compact population to exist. This population in turn improves the entire civic realm. It is essential for our projects to push this correlation. Achieving greater density is a significant piece of the puzzle that allows for transit, cultural institutions, local economies and an active street life to exist. It is this interdependence that makes the understanding and implementation of great public spaces so essential to our mission. As urbanists, we possess the skills necessary to lead the coming age of urban stewardship. It is time Urbanists regained control of our civic realm. After reading Russ’ essay, I am confused about a few aspects of urban construction. If it makes sense to construct narrower streets and smaller plazas, why are wide streets and large plazas being built? Additionally, the need for walkable streets and vibrant public space makes me think of new initiatives in New York City’s Times Square. In Times Square, streets are being closed off to automobiles so that pedestrians have more space to move, and last time I was in the city I saw people camped out on lawn chairs in the streets where cars usually drive. This seems like a first step to creating better public space. NYC is also implementing a cab sharing system this summer. Other cities have shared cabs for years, but New York is finally catching on. In theory, this system will benefit both taxi drivers and riders because rides will cost less, and will therefore encourage more people to take cabs. If more people use cabs to get around, then drivers will have more customers. With people sharing cabs, the streets will be less congested, which also creates a more walkable, livable environment.